The long-awaited Food Fare Cookbook has arrived! The elegantly-appointed e-cookbook contains the cream of the crop from the Food Fare web site, including more than 200 distinctive and original recipes. 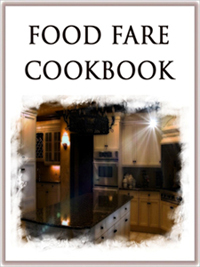 The Food Fare Cookbook is available in Kindle, Kobo, Nook and PDF editions. Select your preference and get cooking! Take a look inside the Food Fare Cookbook with our exclusive screenshots. See a complete list of recipes in the Food Fare Cookbook and view free samples.